Samsung announced its new range of smart televisions in India on Monday. The TVs come under Samsung's Unbox Magic series with a bunch of pre-loaded features that are an industry first. With this, Samsung wants to enrich the TV viewing experience by offering features that will serve the Indian consumers well. Samsung's new range of televisions consist of HD models with the company's Ultra Pix technology and go all the way up to Ultra High Definition (UHD) models with a 4K panel. During the announcement, Raju Pullan, Senior Vice President, Consumer Electronics Samsung India said, "At Samsung, we believe in creating an ecosystem, to provide users with unique solutions that enhance the consumer’s experience and enrich their lifestyle. 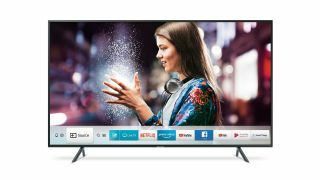 The latest Smart TV range caters to the needs of our consumers with a host of never-seen-before features such as Personal Computer, Music System, Home Cloud, Live Cast and Two Way Sharing. With Samsung’s commitment to deliver best in class products, these Smart TVs will redefine the consumer experience." The new Samsung smart TVs provide remote access to a user's PC or laptop and allow the television to be used as a large display for a computer. The functionality to mirror the screen of the PC or laptop is also present and enables users to extend their desktop to the TV. In addition, the desktop can also be accessed remotely courtesy of Samsung Knox from anywhere around the world as long as it is connected to the Internet. Samsung has also worked on a virtual music system for its smart TVs which mimics the visuals of an actual audio player. Users can even customize the music player with different skins according to their taste. However, the music player only supports USB as the input device and currently does not support any online music streaming service. Samsung has stated that the addition of new elements is in development and they will be integrating a music streaming service down the line. With the addition of a personal cloud, users can view pictures and videos right from the TV. The user's smartphone will need to be synced to the TV and whenever the phone is in the proximity of the television, pictures and videos will be offloaded to the TV wirelessly. Samsung has also worked on a live broadcast and two-way sharing for its new smart TVs. Users will be able to broadcast the live footage from their phone camera to a Samsung smart TV. On the other hand, the TVs also allow content sharing from the phone to the television and the other way round. The new TVs come preloaded with Samsung Smart Hub which is the one stop shop for live TV broadcast, third-party apps like Netflix and Hotstar, among others. Samsung's new range of smart televisions start at Rs 24,900 for the 32-inch model and go all the way up to 82-inch variant. The TVs are available at all Samsung Smart Plazas alongside online and offline e-tailers as well.